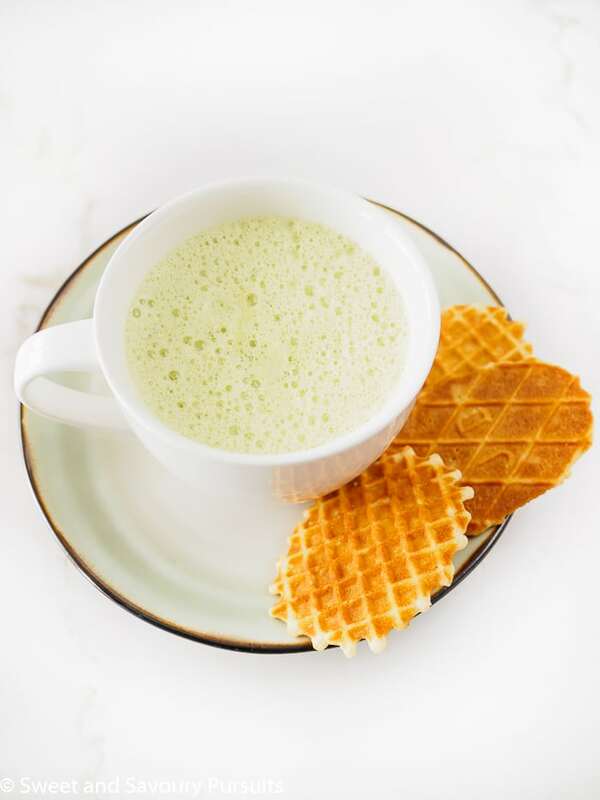 Enjoy this delicious, healthy and perfectly foamy Matcha Green Tea Latte by making it in the comfort of your own home. I’ve discovered I could make the most delightful lattes and hot drinks in my Vitamix. It all started when I was making some hot chocolate for my children, I filled a pot with milk, cocoa and sugar, warmed it on the stove top making sure to whisk all the lumps of cocoa away, and just as I was almost done, I turned around to attend to my daughter (for a what seemed like a couple of seconds), only to have my hot chocolate boil over and create a giant mess! Frustrated with my mess, I remembered that my Vitamix can actually heat liquids. So I decided to make the hot chocolate in the blender and the results were outstanding, and with no vigorous whisking or constant pot watching required, I could actually do more than one thing at a time! And you know what I really love about using my Vitamix to make my hot drinks? Its all the froth that the blender effortlessly makes. So now when I want to enjoy a hot foamy drink, all I have to do is put my ingredients in the blender and let it do all the work for me! Since then, I’ve been using my Vitamix to make all sorts of tasty drinks. My favourite one so far has to be this simple Matcha Green Tea Latte. I love Matcha and since it has beneficial health properties, I like to use it as much I can. You can see how I’ve used it in my Mini Almond and Matcha Bundt Cakes and in these adorable Matcha Green Tea Sugar Cookies. 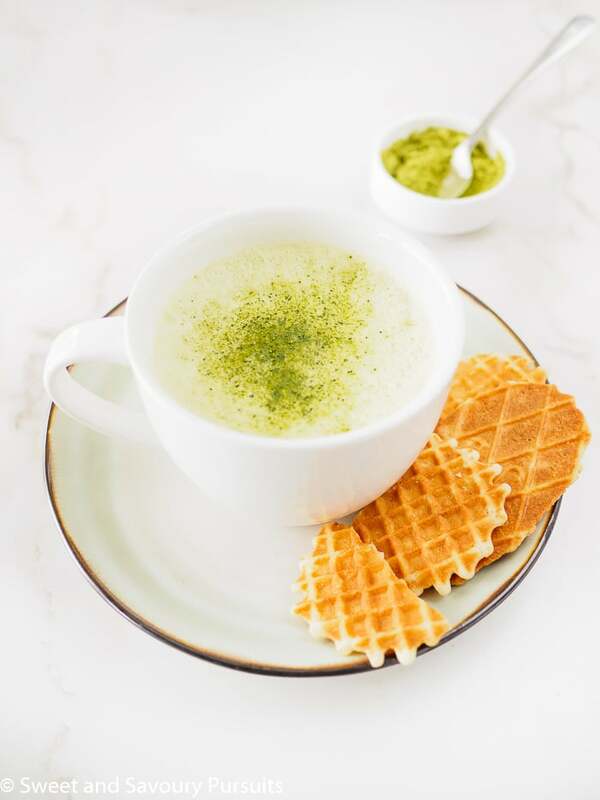 This recipe for Matcha Green Tea Latte is a simple one, feel free to add flavour extracts such as almond or vanilla to add more flavour to your drink, personally I love to taste the flavour of the Matcha so I like my latte as pure as possible. You can use whichever milk and sweetener you prefer so the choices are endless. Place all ingredients in Vitamix (or other high powered blender) container, turn machine on and increase speed to high. Blend until frothy and hot or desired consistency is reached. On the stove top, warm 2 cups of milk of your choice until hot. 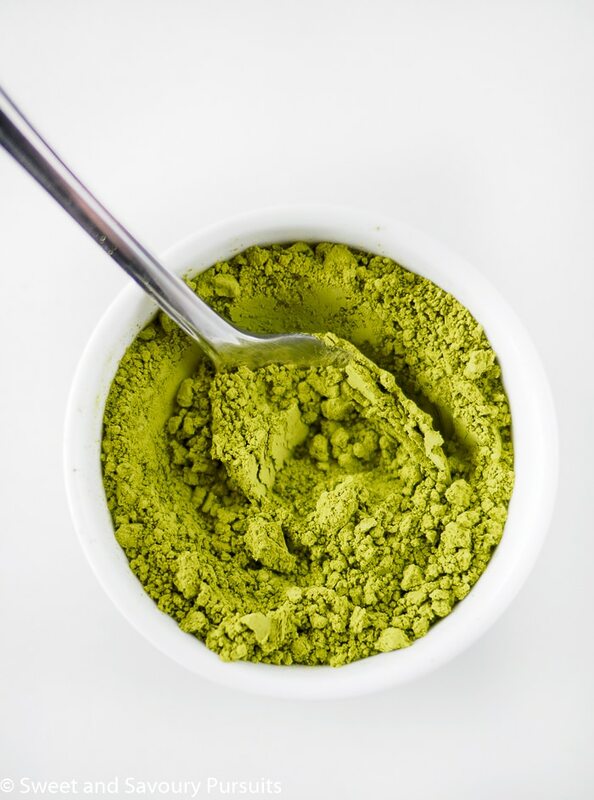 In each mug, add one teaspoon of matcha powder with a little bit of hot water. Whisk the matcha and water to make a thick smooth paste. Pour hot milk into the paste and stir. If desired you can add a sweetener here. If you own a milk frother, you could use it to froth the top of your latte. By the way, although this seems like a sponsored post, it isn’t, I just love my Vitamix! Love the color and how frothy it is. Thank you, it is a pretty colour and yes the Vitamix does a great job at making the latte super frothy! What a beautiful colour. I’ll have to give this a try! Thank you Caroline, it’s a lovely color and tastes delicious as well!